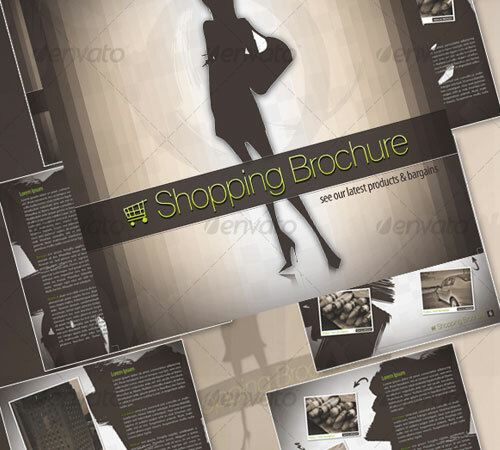 Brochures are one of the most important form of media used today in advertising, promoting and giving information to the society at large. 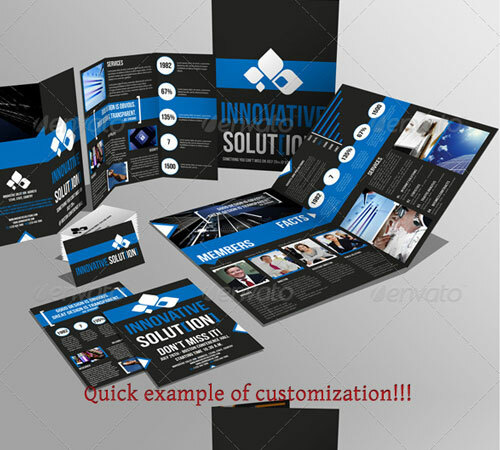 Most company today have focused in providing a unique, informative and eye-catching brochures to help their services and products to stand-out among the competition. 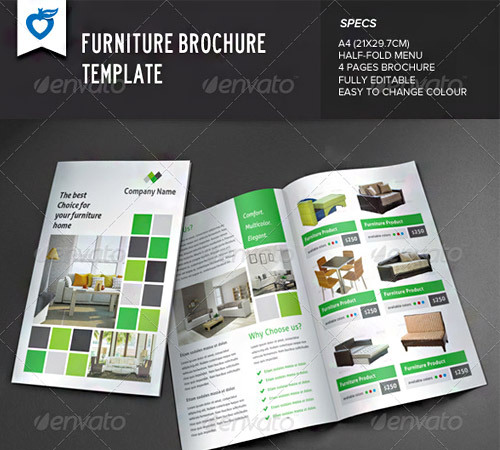 Various brochure templates have been used extensively to cater the varying needs of companies, organizations and societies. 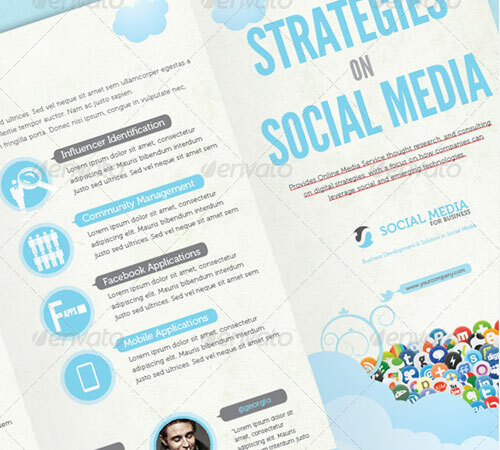 These templates must have the important factors to become an effective brochure and create a big impact in presenting information that is disseminated. 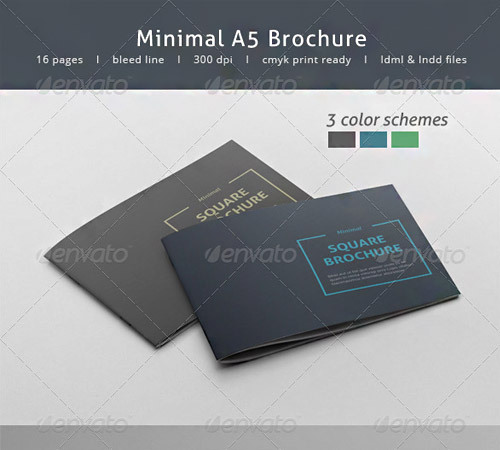 These 45 Revisable Premium Brochure Template Designs from GraphicRiver showcases some cool and unique brochure templates that many organizations may look into. 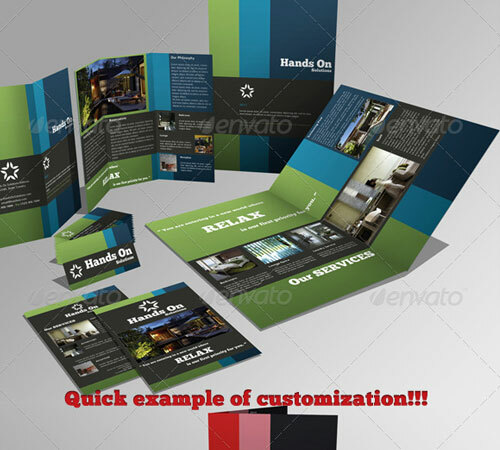 These files are easy to edit and are print-ready to save you time in customizing the template. All you need to do is simply edit the texts and add your photo or image, and voila! you’re ready to go!! 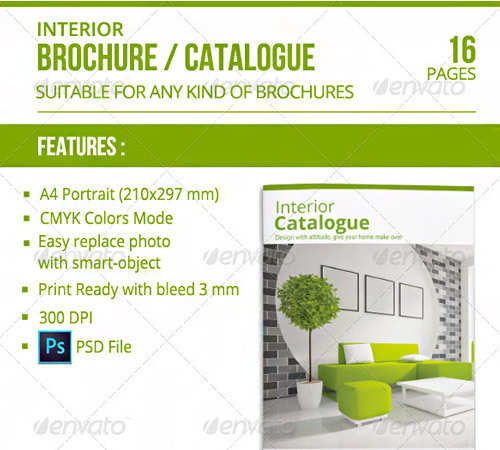 Some available features are given to bring out the add-ons that are in-store should you decide to purchase the brochure template. Browse through them and wisely choose the template that may be useful and compatible to your needs. Start browsing!!! Design is a never-ending evolution. With the changing trends and demands, different products keep on coming. In this update, we have added more fresher designs for you to choose from. Scroll down and check them all out below. Come, take a peek, choose your pick. 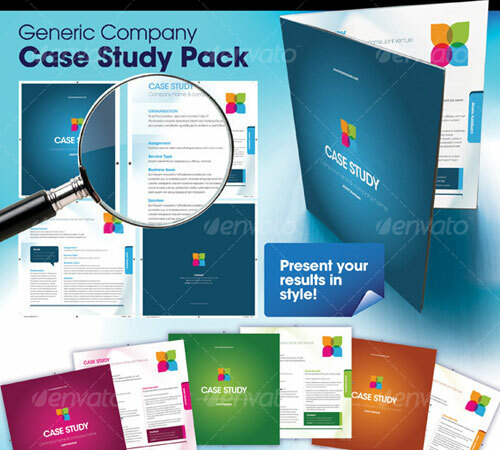 The brochure may be used to present case studies in a clean and professional way. • Character and Object Style. • Font info in readme: Helvetica Neue, Adelle Basic (free) and St Marie (free). 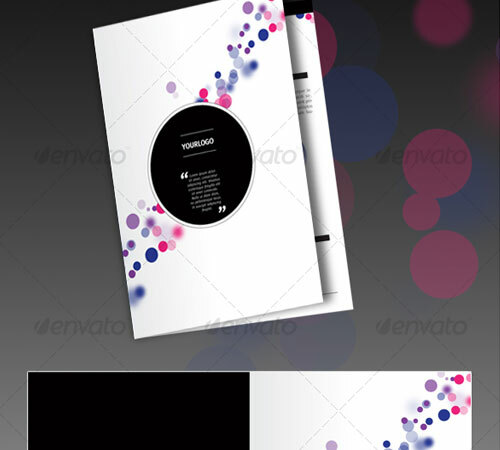 • Background Elements (Illustrator CS3 ). 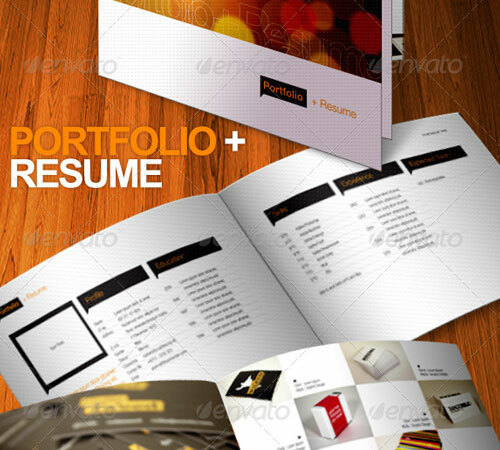 The template can serve as a printed portfolio and at the same times makes it very easy to attach to an email as pdf file. • Multiple color schemes, one for each section. • Everything has been aligned to a grid and a baseline grid. • Font information included in readme file. 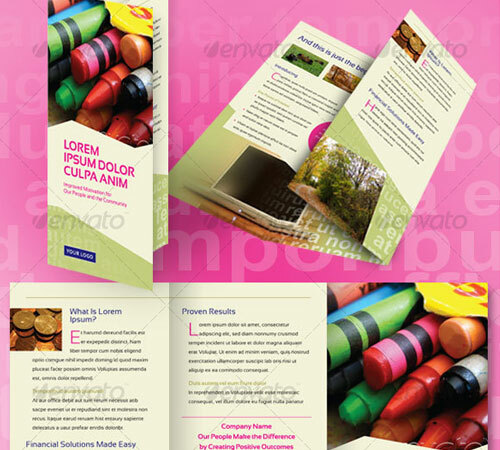 This template is a completely editable INDD document, that allows you to change colors, positions and typefaces. 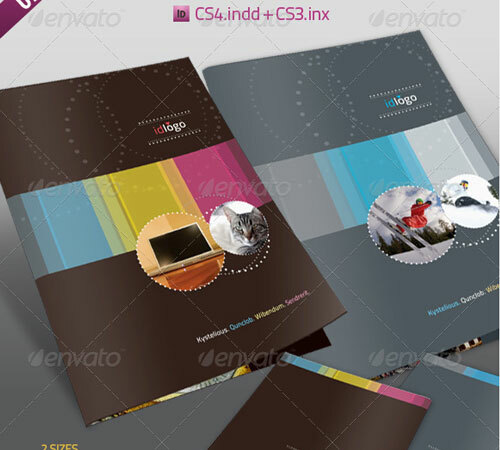 • Source Indesign document (CS4 + INX for CS3 ). • JPG + PDF preview. • CMYK 15×21cm + 3mm bleed. 16 pages + cover on different file. All layers are fully editable in this template wherein text, photos and shapes are in separate layers for easy modification. • All layers are fully editable. • Text, photos and shapes are in separate layers for easy modification. • Links for download photos are in help file. 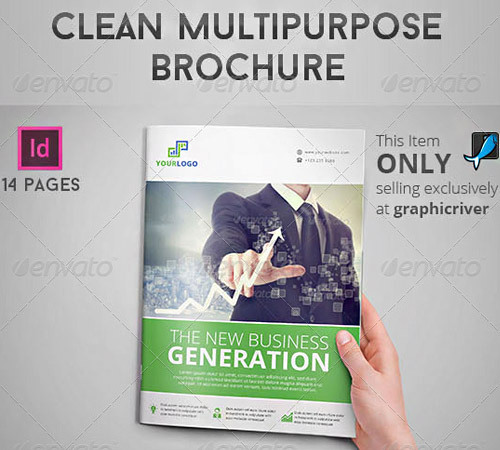 • 8 page Clean Modern Style Brochure. 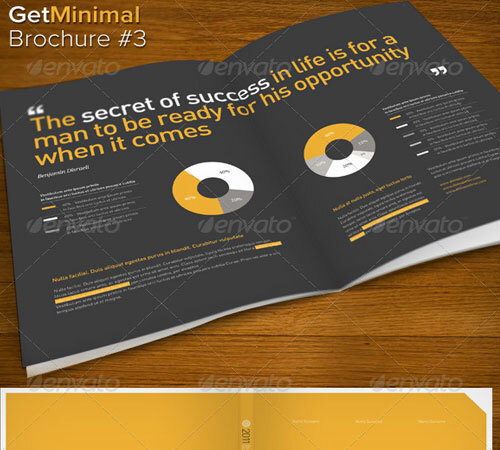 This brochure template is suitable for freelance designer or photograper. The minimalist and clean design creates a more professional look. 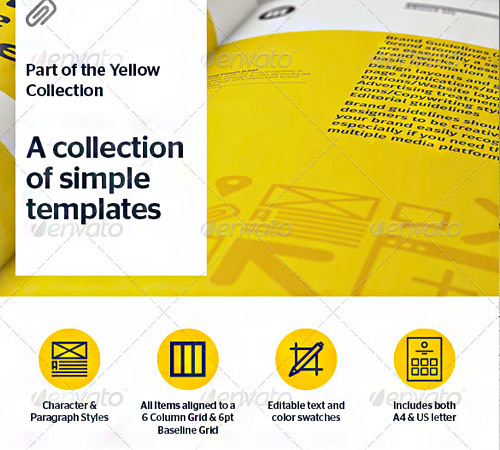 • Cover editable with high resolution. • Ready for Print (300DPI CMYK ). • Text, color and images changeable. 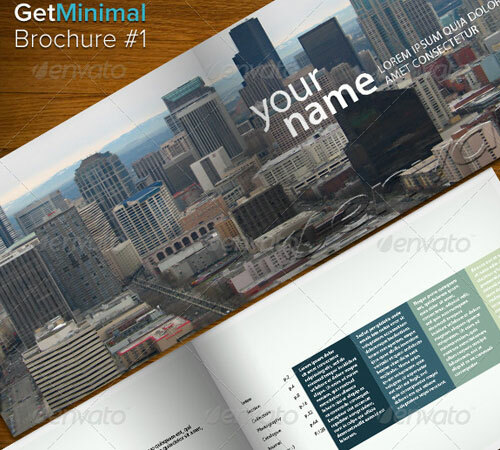 In this brochure template, sample texts and images are easy to replace with just a few clicks of mouse. • bleed area: 0.25 inches. • Color: CMYK / 300 dpi. 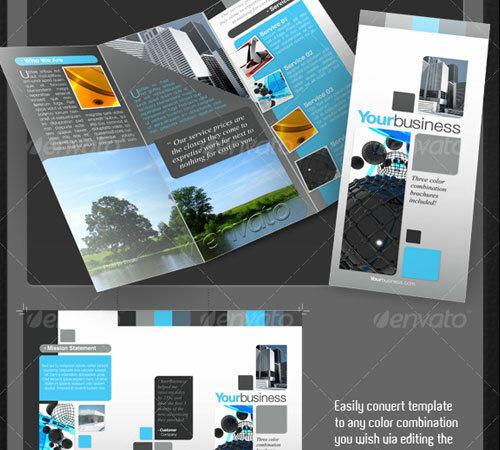 • template pack contains 3 psd files, 6 JPG files for preview purpose (resized) and readme file. 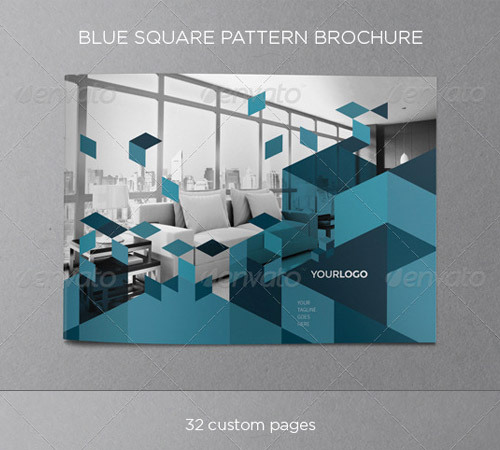 Perfectly laid out template brochure that allows you to convey a sense of modernity, cutting-edge and importance about your company. 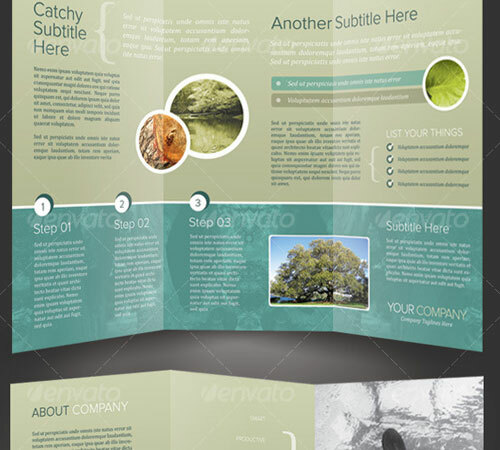 • Single-fold A3 (resulting in A4 pages). • CMYK (ready for print). • Grid based design arrangement. • Fully labeled and easy to understand layers and groups . 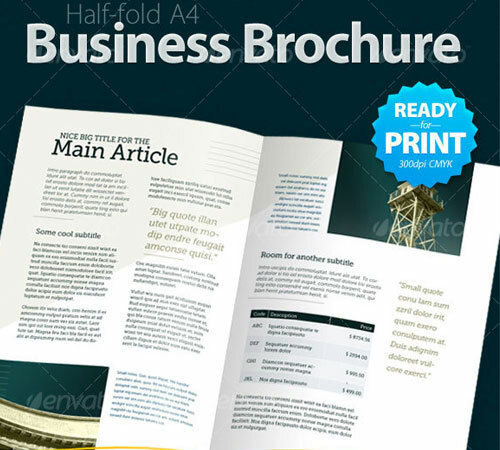 The template is designed with the true business professional in mind—spanning the gamut of communications materials that business owners frequently need including identity systems, corporate brochures, presentations and much more. • Print ready and built to specification. Just download and add your information. • Clean and modern design with ample white space. 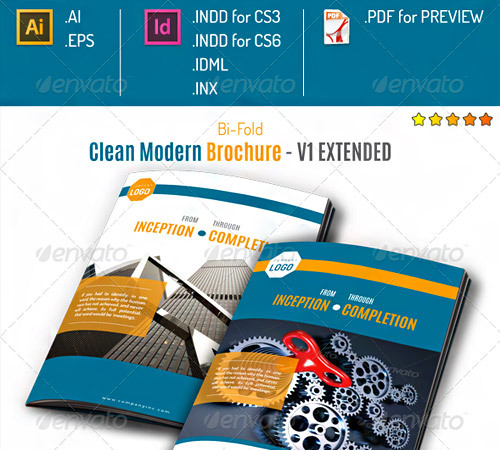 • All documents in InDesign, Photoshop and Illustrator formats for maximum convenience. • All Fonts FREE to download. The brochure is designed in CS3 indesign, special icon also supplied (created in photoshop) all elements are easily editable, layers used and is perfect in learning INDESIGN. 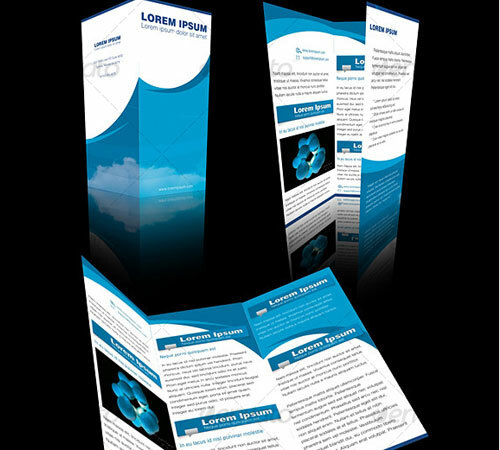 • Brochure designed in CS3 indesign. • Special icon also supplied (created in photoshop) all elements are easily editable. The template is Print ready @300 DPI CMYK with easy to follow layered Photoshop files for quick editing. • Print ready @300 DPI CMYK. • Easy to follow layered Photoshop files for quick editing. • The font used in the design is Helvetica. 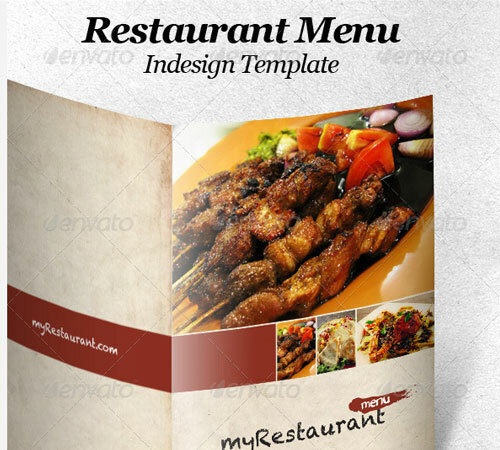 This brochure is very suitable for any restaurant business that related to keywords such as restaurant menu, restaurant menu templates, restaurant menu design, and restaurant menu maker. • A4 size (21cm x 29.7cm). 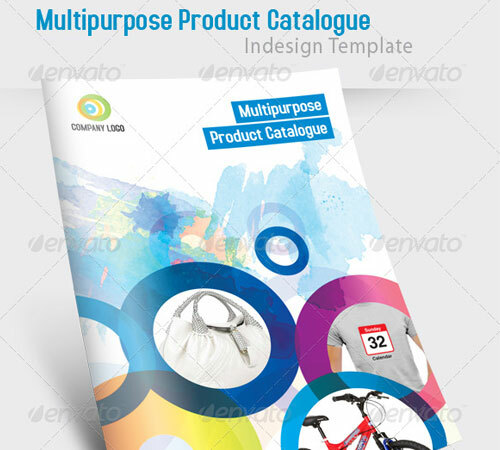 Multipurpose Product Catalogue is suitable for any product business, and comes with 16 pages premade with 3 different style for each layout. 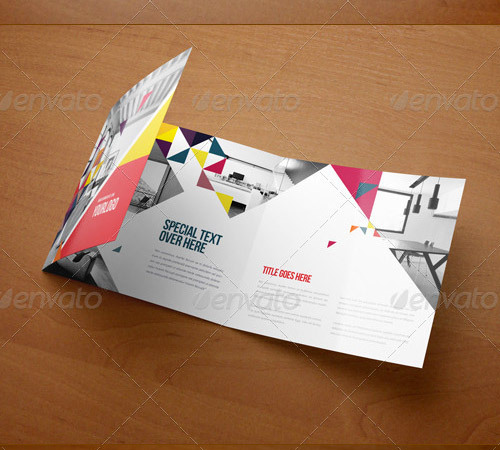 • 1 – Adobe Indesign format (.indd). 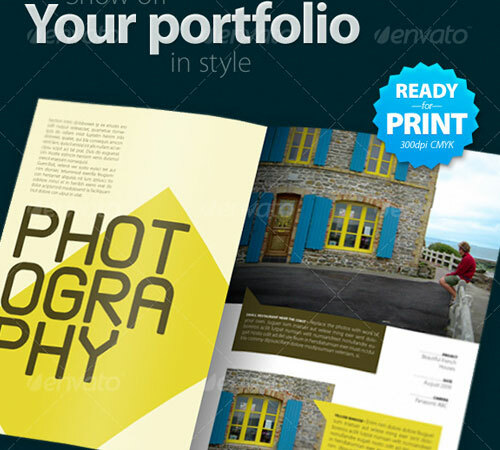 • 7 – Adobe Photoshop format (.psd) included cover, background graphic. 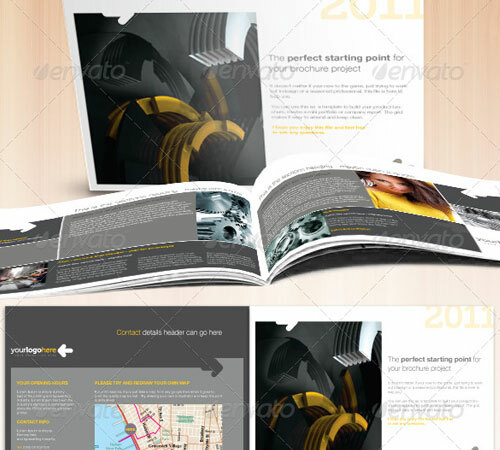 • 1 – Preview Layout (.pdf). • 1 – Documentation (.pdf). A clean layout that simply goes with everything. All elements layered per page for easy editing. • Size: A4 (+ 5mm bleeds). • CS File Type: Layered .psd. 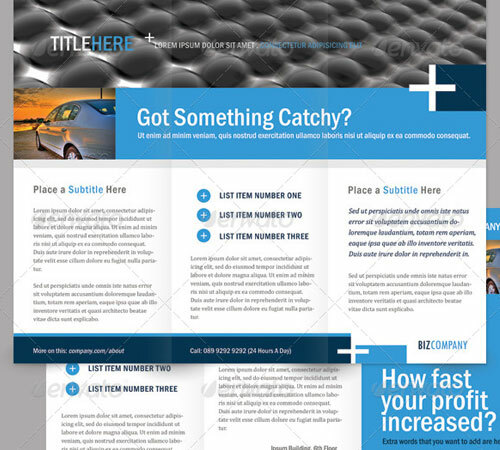 A very clean and corporate looking business brochure. You could use it as a newsletter or flyer as well. Drop in your own text and images, send it to the printer or attach it to an email as pdf file. • All the shapes and colors are editable right in InDesign. • Museo font information included in readme file. 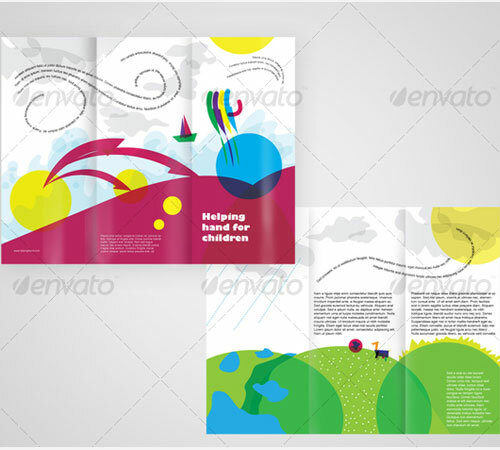 • Graphics Files Included: AI Illustrator, InDesign INDD, Photoshop PSD. • Minimum Adobe CS Version: CS3. This press ready CMYK template is perfect for business or personal use: you can also use it for booklets, different types of annual reports, newsletters, brochures etc. • A4 size 8.5×11 (210×297 mm), + bleed 5 mm. • separate layer for text and objects . • Object styles included (to change color scheme easily). 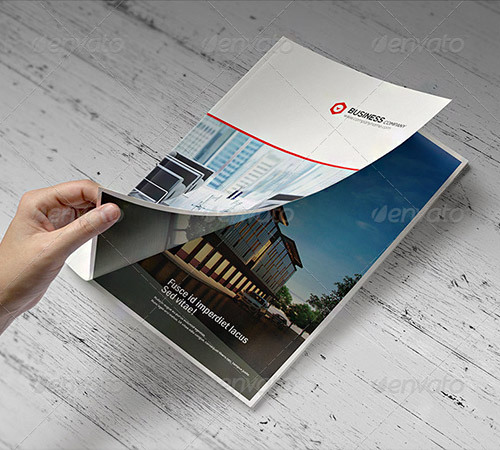 Clean layered Brochure easy to use and change. Can be used for any project regardless od content. • Page size: 210mm x 148mm / 8.2677×5.8268in. • Bleed: 3 mm / 0.1181 in. 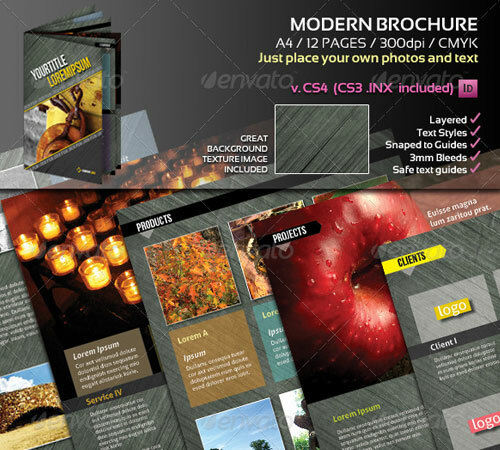 Easy to edit brochure that can be used for various purposes e.g. energy company, industry, architecture, design etc. • .indd [InDesing CS3 Doc]. • .inx [InDesign Interchange for using old InDesign]. • EPS files [Illustrator CS3 Doc]. • PDF [Adobe Acrobat file]. The template contains A4(+3mm bleeds), 300dpi CMYK , fully editable, layered, text styles, safe text guides, 2 color variations, fonts free for commercial use. • Built using Indesign CS4. 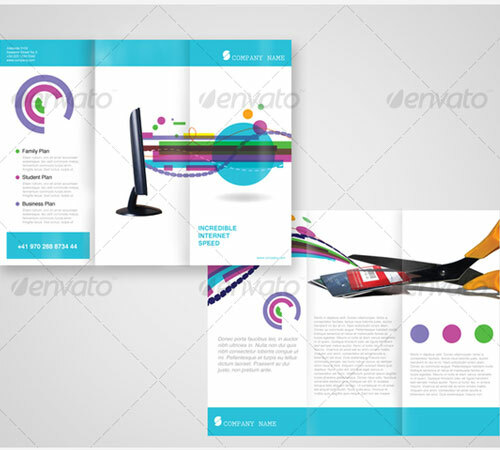 A creative indesign brochure, cmyk. This fresh looking brochure needs a font called META. 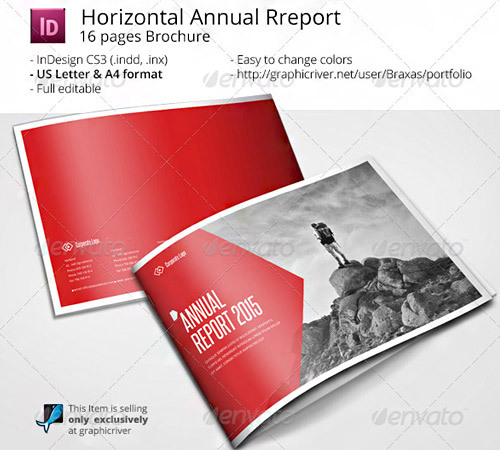 • Graphics Files Included: AI Illustrator, InDesign INDD. 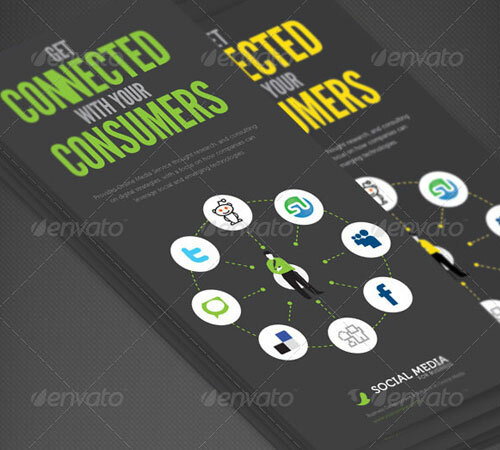 A stylish edgy brochure for internet providing companies. • Graphics Files Included: AI Illustrator. Everything layered in groups per page for easy editing. Photoshop files come with smart object layers. • Graphics Files Included: Photoshop PSD, AI Illustrator. • Minimum Adobe CS Version: CS4. Size: A4/29.7×21cm (+ 5mm bleeds) Color mode: CMYK Resolution: 300dpi Application: Photoshop (Minimum application CS), InDesign CS4 (+CS3 .inx included). • Size: A4/29.7×21cm (+ 5mm bleeds). • Color mode: CMYK Resolution. 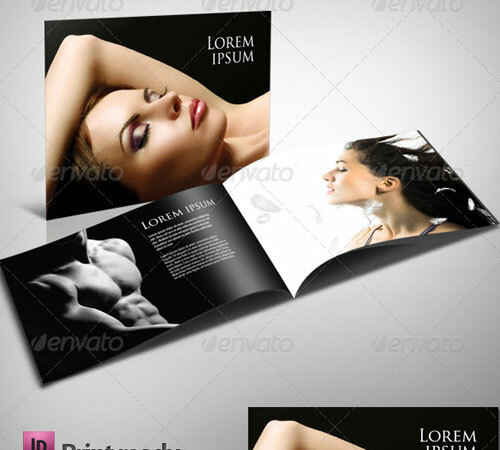 • 300dpi Application: Photoshop (Minimum application CS). • InDesign CS4 (+CS3 .inx included). A nice clean brochure design including 8 pages. Created in Photoshop CS4 wherein all layers are intact and fully editable. • Created in Photoshop CS4. • All layers intact and fully editable. • Resolution 300 dpi in CMYK. 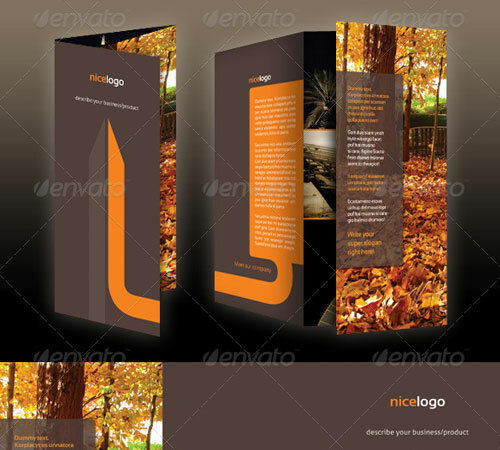 The template pack contains 2 psd files (the source files), jpg files (sample previews) and readme file. 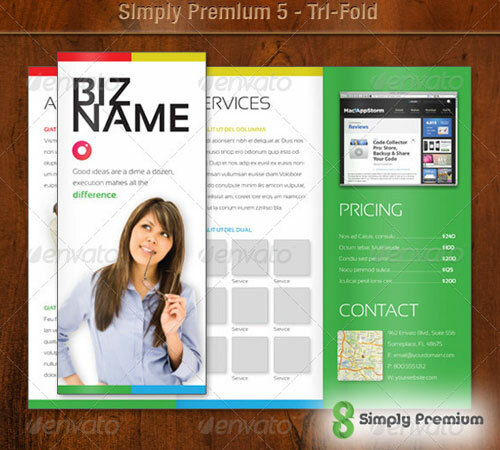 This template is perfect for any company that needs a clean yet modern corporate style trifold brochure. 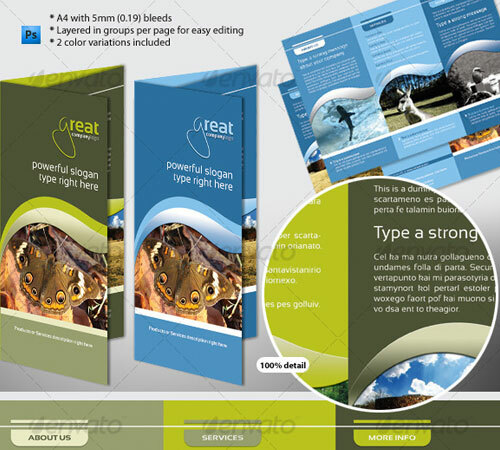 • 2 color schemes included, each has its own psd file. 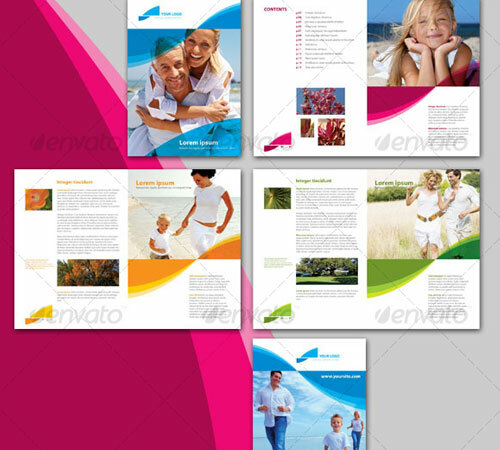 A contemporary Print template package. Very useful for social media print campaign. • Adobe illustrator CS3 or latest. 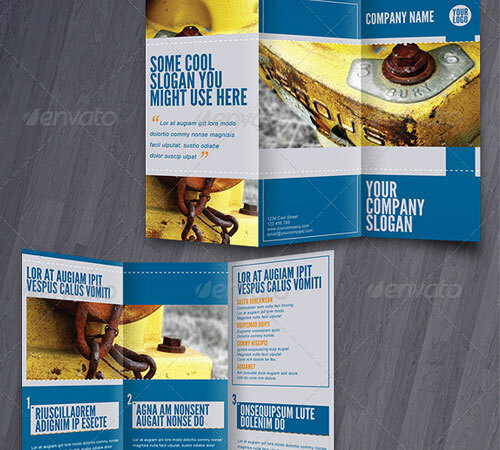 • Trifold Brochure A4 size. • Advertisement A4 size Landscape. • Business Card 9×5.5 cm. • A3 ISO 420 ×297 mm (16,5×11,7 inches) + bleeds (4x A4 Pages). 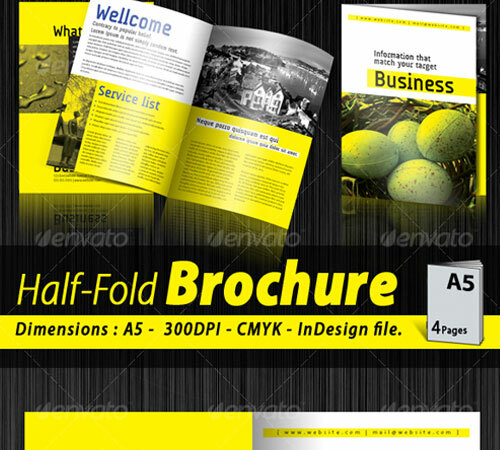 • Trifold Brochure A4 ISO 210 ×297 mm (8,27×11,7 inches) + bleeds. • Flyer A5 ISO 148×210 mm (8,27×5,83 inches) + bleeds. • Photoshop .PSD, Illustrator CS (.Ai, .EPS), InDesign CS3 -4-5 (.INDD, .IDML, .INX). • InDesign CS3 -4-5 (.INDD, .IDML, .INX), Illustrator CS (.Ai, .EPS), Photoshop (.PSD). 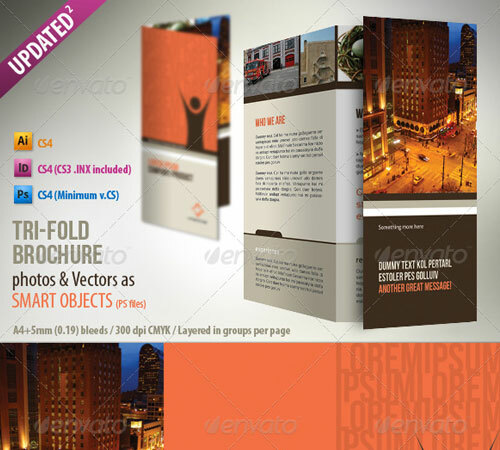 This is a 3 pack of fri-fold brochures created using InDesign CS3 . The files are completely editable, all of the fonts used are free and downloadable. • A4 page size (with bleed 3mm). • CMYK @ 300 DPI – Print-ready. 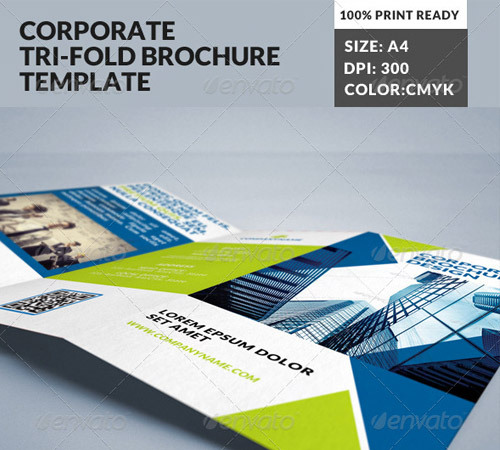 A contemporary Print template package. Can be very useful for social media print campaign. • Contemporary and professional style. 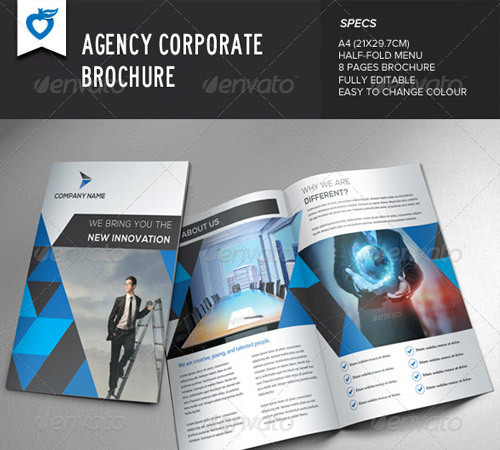 Clean, modern and professional looking, this is an ideal A4 brochure for your company, business, products or even portfolio presentation. 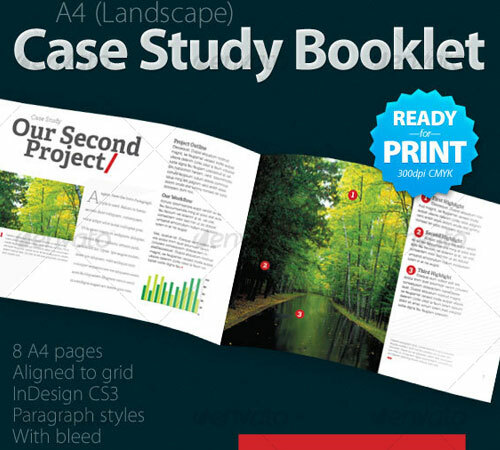 • Regular mid-size of 12 pages. • Graphics Files Included: InDesign INDD. 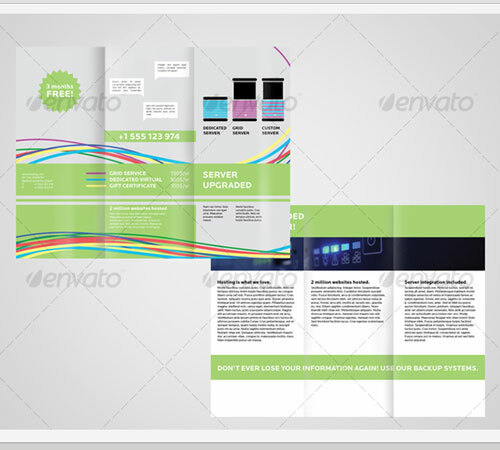 Vitric brochure ready for print with highly customizable layout – Change colors by simply editing the Color Palette – Automatically update photos by replacing files in the Links Folder. (similar to XML ) – InDesign CS3 & CS4 – Guides for folds in the slug area for easy production. – Comprehensive layers and help file included. • Automatically update photos by replacing files in the Links Folder. • InDesign CS3 & CS4. • Comprehensive layers and help file included. 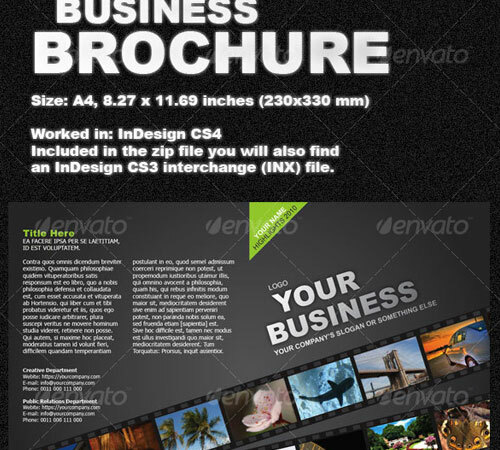 Easy to edit 6 page tri-fold corporate financial brochure (but can be used for various purposes e.g. energy company, industry, architecture, design etc.). • Size: 297mm wide x 210mm deep. • Layered photoshop files used on the typography composition. • CMYK with trims and bleed. 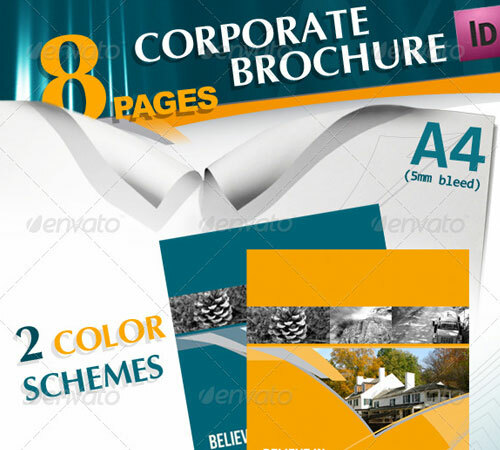 • Easy to edit 6 page tri-fold corporate financial brochure. 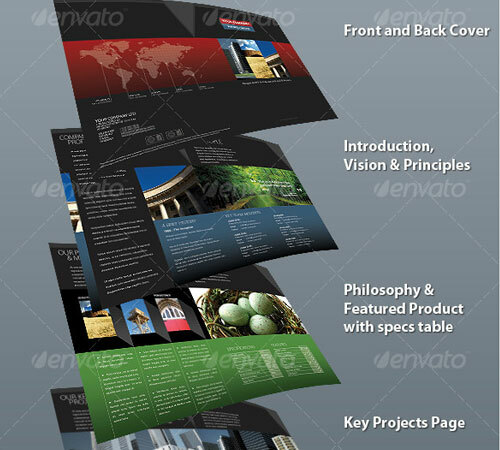 • Source Indesign documents (CS5, CS4 , CS3). • CMYK A4 + 3mm bleed. 24 pages + cover on different file. Stylish new age brochure ready for print for a hosting company. 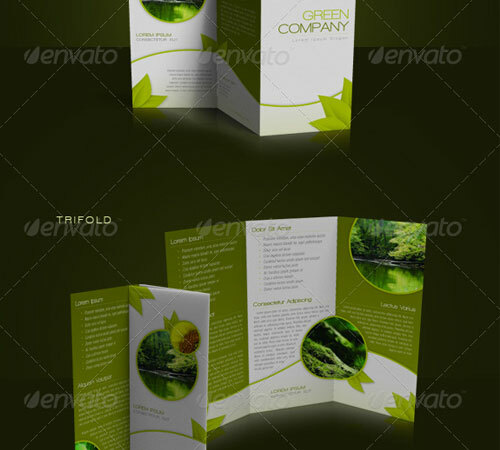 Green Business Brochure two-fold An elegant brochure that can fit your needs, be it a company, agency, non-profit, school, etc. • Size: A4, 8.27×11.69 inches (210×297 mm). • InDesign CS3 interchange (INX) file. • Worked in: InDesign CS4. 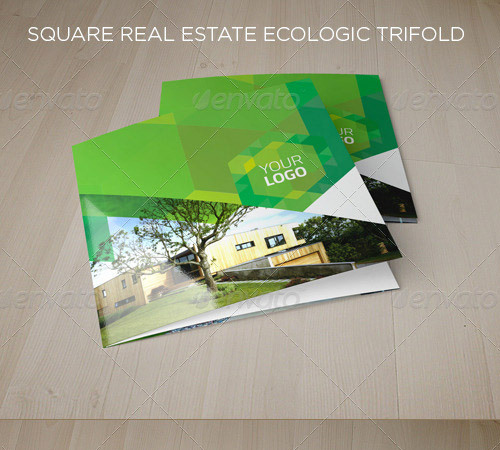 Clean and fresh Trifold Brochure InDesign Template that matches perfectly with green companies or green products. Really easy to modify to another color scheme. • Ready to Print CMYK. • Includes a compatible .IDML File for older InDesign Versions. 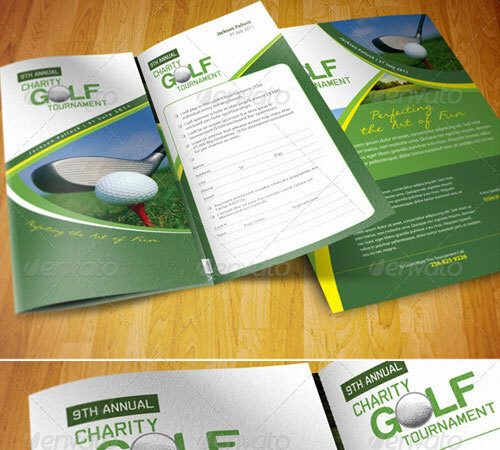 Golf Tournament Brochure Trifold + Flyer Ad suitable for any related to golf industry. With modern look, clean style It can be your golf charity campaign for non-profit organisation etc. • Easy to edit text & images. • Buy 1 get 2 item. • comes with brochure trifold that you can put info about your tournament and fill up form to get your prospect feedback, with additional flyer ad can be your promotion campaign into magazine etc. 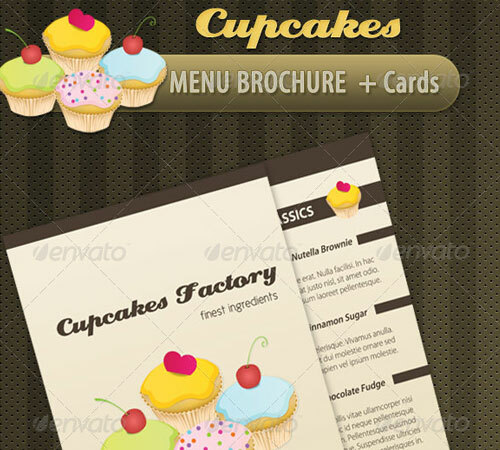 Irresistible and sweet PSD CUPCAKE menu brochure that is very easy to customize. 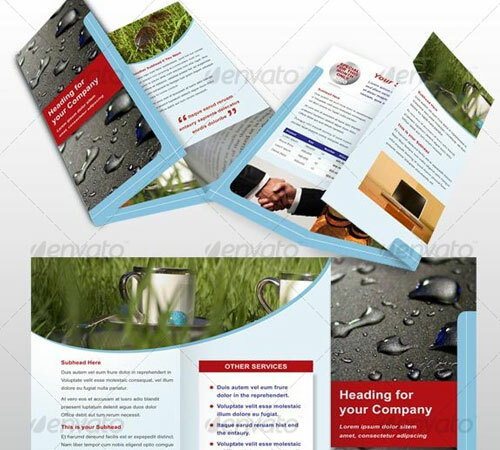 • Menu brochure (both sides): 11.19×7.78 inches. • All separated PSD files, layered and organized so you can quickly edit them. • CMYK in 300 dpi. Print ready, all files have crop marks and bleed lines (0.25 inch). Brochure illustrating in a childish way the end of a storm, the beginning of a new dawn. Creative use of text. Oh yeah! I was just looking for brochure templates yesterday! Thanks dude! The 6 fold one is awesome! Thanks for the post Ebrian! These brochures has always been important in marketing. Will surely share this to my colleagues! Thanks for sharing! The helping hand looks cute! 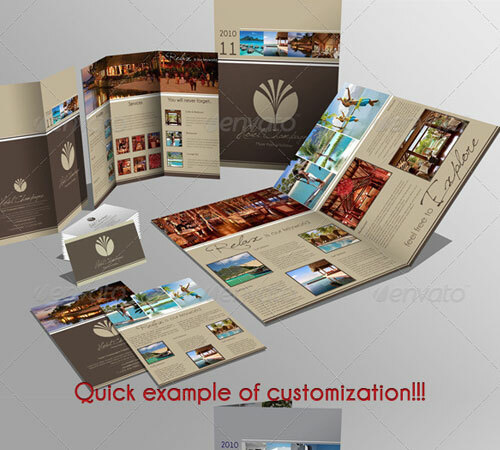 Do you have tutorials on how to make brochures? Again, you guys have put together a great resource. I just purchased one of the identity sets you guys had above. Thanks for taking the time to put this together!